2009 has Brittney graduating from UNC- chapel Hill. She spent time in Chicago this summer preparing for her new career as a teacher with Teach for America. She has a home in Bethel, NC and a job teaching 4th grade in Princeville, NC. She seems to enjoy her school kids, but has not quite been sold on a career in teaching. She continues to see a nice young man - Josh Mayes. Danielle has spent this past year in Texas - some in Uvalde, some in Corpus Christi, Houston and now she is settled in Bastrop. My cousin, Amanda King and her family, have been kind enough to open their home to allow Danielle to reside there. She is working at Wal-Mart and seems to have found some peace and has settled down. As a parent, I am ever so thankful for that. A trip home to NC is a goal I have for her in 2010. Hunter completed 5th grade and has found himself enjoying Middle school as of August this year. Soccer continues to be an important part of his activities and we even enjoyed a season of Baseball. Remarkably this year, Hunter began to recite all kinds of Baseball stats and historical info and a huge love of the game. So, baseball parents and fans we have become. Walker has enjoyed part-time pre-school this past spring and this fall/winter season. He loves hanging out with dad working on the farm during the week when Tim is home. His vocabulary has grown and he can be counted on to "clean up" after himself. He has mastered the art of playing on Hunter's old DS game boy. He also enjoys computer bike/four-wheeler games. Tim has had a good year, enjoying working on the weekends in CVT and pursuing his many hobbies. The mean Turkeys, (the reason for Walker's belly button. he he ) all of the chickens and their eggs (many have enjoyed the treasures of these laying hens! ), his enormous garden, his rejuvenated interest in pottery and the Long leaf pines and fruit trees that he has planted - to name a few of his projects. He has been a wonderful support for me all year and my love continues to grow deeper and deeper each year. His family has had the birth of Maeve and Elijah. His dad has been challenged with a kidney removal and chemotherapy, but his spirit is still active and strong. Mike, his brother, has been plagued with a frustrating bout of Chron's Disease. Fortunately, a strong family support system helps everyone feel loved and secure. For me, my year started with 17 of my employees having their position eliminated. The economy has been in quite a state all year and our hospital has felt the pains. (Obama is our new President and the first African American to hold this post). This was an awful time for me and I struggled for a while trying to reestablish faith in my professional values and my desire to be a nurse leader and the realities of healthcare. Fortunately, throughout the year I enjoyed an AONE fellowship that sent me several places (San Diego, San Antonio, San Fransisco, and Washington D.C.) and I grew in my knowledge about healthcare leadership. I have also continued to pursue my MSN. I obtained another area of responsibility with my job - the NeuroDiagnostic area. A small department with two wonderful techs. A challenge to continue to balance work, school, family and life is ongoing for me. I love them all and never seem to figure out how to find enough hours in the day. I took up playing some tennis, hoping that some physical challenge would be stress relieving as well. I also became a fan of FaceBook. I have been in contact with friends from the past that otherwise would just be memories. My dad's health has been relatively good this year - with his elimination of smoking from his daily routine. So, Tim turned 49, I turned 43, Brittney 23, Danielle 21, Hunter 11 and Walker was 3 during 2009. I hope that as my family reads this that thier comments about memorable moments in 2009 are added. We each have so much to be thankful for. With every year that Brittney gets older, it is yet another anniversary year that I have been blessed to be a mother. As she enjoys the benefits of age and wisdom, I reflect on the many joys my kids bring. Each birthday always brings a sense of pride and an immense feeling of happiness. 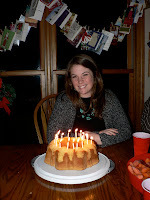 Brittney has always, thus far, enjoyed a celebration specifically for her birthday. Its so close to Christmas, but we have tried to ensure birthday gifts were Birthday and Christmas was Christmas. Her and her dad tried to create a July birthday, but instead it meant two birthdays rather than just one. Tim decided this was defeating the purpose of saving money. Her party was filled with a cake baked by her dad and family gathering for spaghetti dinner and conversation. 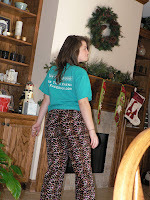 These exciting looking pajama bottoms were compliments of her uncle Jerry and Aunt Leesa! Quite fun and attractive. Although the model does not show all they have to offer - hip huggers and bell bottom seem to be part of thier appeal, not just the color and velour fabric. Best of all was a Birthday song and kiss from her little brother. What would a Christmas holiday season be without the enjoyment of a Christmas program at church? This year at Eagle Springs Baptist church, our new preacher and his lovely wife put together a spectacular presentation. The choir sang and the Christmas story was shared. One of the most memorable elements of this program was a song that played that told the story of the three kings and what they brought at the time of Jesus's birth, but more importantly than these three kings was the birth of a King. This song and story was depicted with the youth wearing all black and using sticks to portray the story. They were strategically placed in diferent formation to add images as the song played along. A very moving song and message. Treat bags followed as well as fun conversations with all the different members of the congregation gathered in the Fellowship Hall. My brother and his family (Leesa and her kids - Braden, Bailey and Blake) were with us which made the night even better! 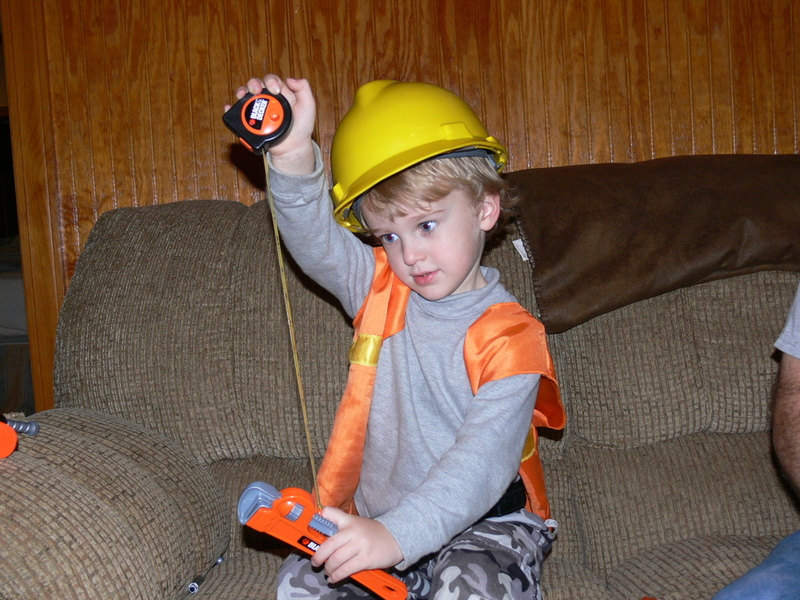 Walker got a little toolkit from his grandaddy this week. As you can see, he is enjoying it greatly. He particularly likes the hat and vest. Seems he likes to dress up a bit. Anyhow, he is really putting the pressure on me as a handyman. The jobs that I have been putting of, he is trying to take over! Looks as if I may have to get busy if I am going to not be put out of business. And BTW, where can I get a cool vest like that?